Heat oil in a pan and add onion slices and fry them till it turns light brown.Take out fried onion from the oil and smash them with the help of hands and keep aside. Now fry almonds with same oil and turn out them as well. Now add more oil in a same pan and put bay leaves,cinnamon,green cardamoms and let them crackle then add chicken pieces and fry them for one minute. Add garlic,ginger paste,garam masala powder,red and dakhni chilli powder,poppy seeds and salt and cook it for 2 minutes. Now add yogurt and smash onion and stirr it well and add water. Add nutmeg and mace powder and kewra and give a dum for few minutes. 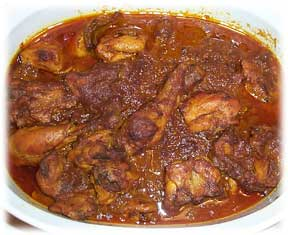 Serve with naan or taaftaan.